Introducing an extraordinary new opus in the ongoing saga of the Métiers d’Art collection, Vacheron Constantin presents The Legend of the Chinese Zodiac – a series of captivating timepieces based on the 12-year cycle. It begins with the Year of the Snake model, a symbol of the periodical nature of time, of seduction and of refinement. Since its founding in 1755, Vacheron Constantin has excelled in the field of precious ornamental techniques and cultivates passionate ties with the artistic crafts. The latter provide the Geneva-based watchmaking House with the opportunity to highlight its fundamental values – including of course its constant quest for excellence, as well as openness to the world expressed through unconditional support for both native and foreign forms of artistic expression. China, a land with which Vacheron Constantin first began establishing a trust-based relationship from 1845 onwards, is famous for a number of discoveries including the invention of paper. It also initiated the art of paper-cutting or Jianzhi, a technique that appears on the UNESCO Intangible Cultural Heritage list, and is echoed in Scherenschnitt, the popular art of paper-cutting born in the Pays d’Enhaut region of Switzerland. Sculpted in paper according to the principles of Jianzhi, the animals of the Chinese zodiac provide a remarkable demonstration of the art of using full and empty spaces. A challenge that Vacheron Constantin has taken up and translated into the field of watchmaking thanks to the skill of its experienced artisans. Engravers and enamellers have worked in alternating pairs on the Year of the Snake, models crafted in pink gold or platinum and issued in two 12-piece limited series exclusively available through the brand’s own-name Boutiques. 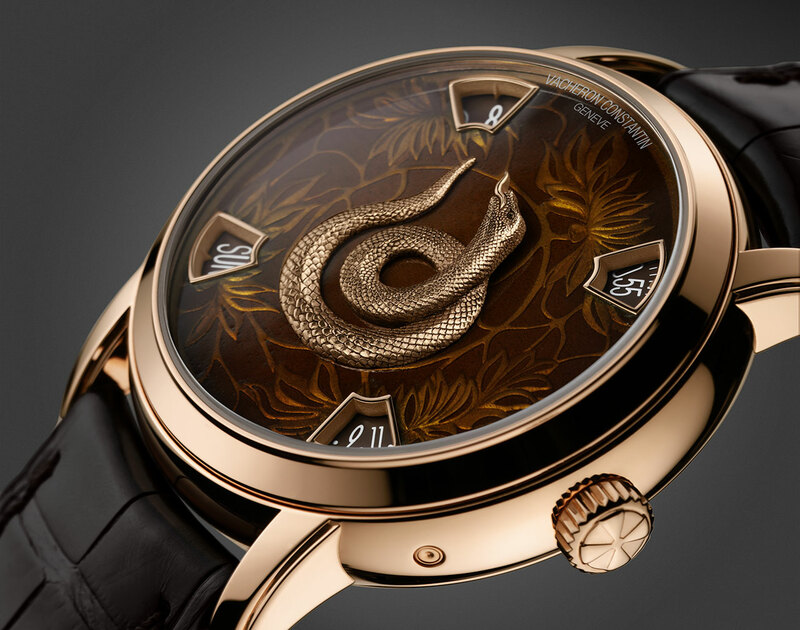 The leaf motif appearing on the dial and stemming from classic Chinese iconography, is etched directly in the metal. The pattern remains semi-embedded and stands out from its gold base by a subtle stage-setting of variously accentuated reliefs creating a depth effect. The raised leaves appear to be floating over the dial. 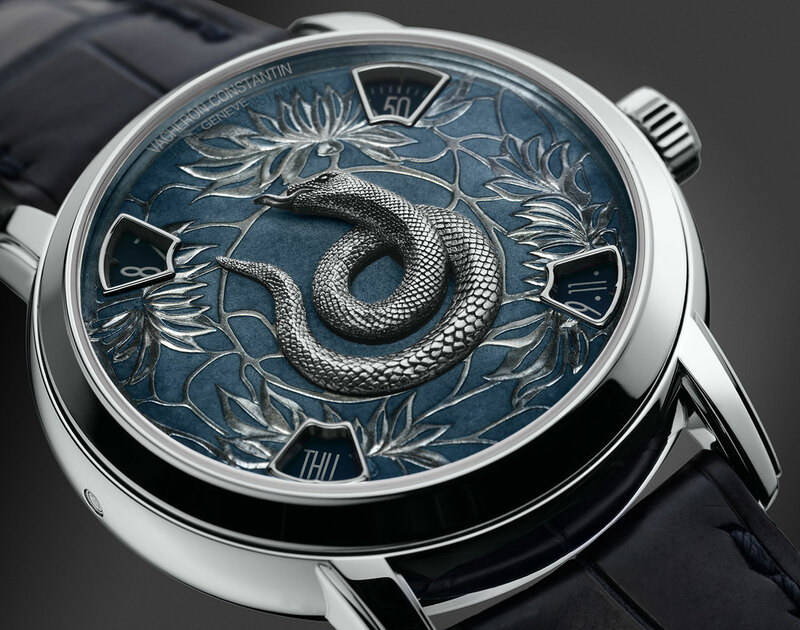 With the snake engraving, on which crafting the scales alone represents at least 30 hours of work, the artisan provides a tangible expression of the artistic vision behind this creation. Then comes the stage of Grand Feu enamelling, a technique invented in Geneva and which remains the exclusive preserve of a rare breed of artisans. By applying the enamel in successive layers, the enamel specialist further enhances the visual intensity of the blue or bronze-toned dial. The necessity of maintaining tight control of the colour and the reactions to the firing process that takes place in a kiln at around 800 to 900°C, calls for a specific way of reasoning that takes years to acquire. A final layer of enamel is then applied before a final firing operation that vitrifies the dial and lends a shiny glazed effect that gives added definition to the floral motif. Métiers d’Art The Legend of the Chinese Zodiac collection owes its superb scope for expressing the artistic crafts to Calibre 2460 G4. In keeping with its longstanding tradition of offering a broad variety of original displays, Vacheron Constantin perpetuates the art of watchmaking by providing a hands-free display of time. It does so through four windows respectively revealing the hour, the minutes, the day and the date. The first two indications are of the dragging kind and the last two of the jumping type, and each appears through one of the four apertures arranged around the central dial motif. Beating at a rate of 28,800 vibrations per hour, the mechanical self-winding movement is equipped with a 22-carat gold oscillating weight adorned with a dynamic geometrical motif inspired by the shape of the Maltese Cross, the historical brand emblem. All its parts are treated to exceptionally sophisticated finishing that meets the criteria laid down by the Hallmark of Geneva – one of the highest tokens of horological craftsmanship created in 1886 and recognised around the world. On the occasion of the recent 125th anniversary of the Hallmark, the 12 original criteria governing this distinction were updated. Having previously applied exclusively to the movement, the new Hallmark of Geneva criteria now certify the excellence of the watch as a whole. 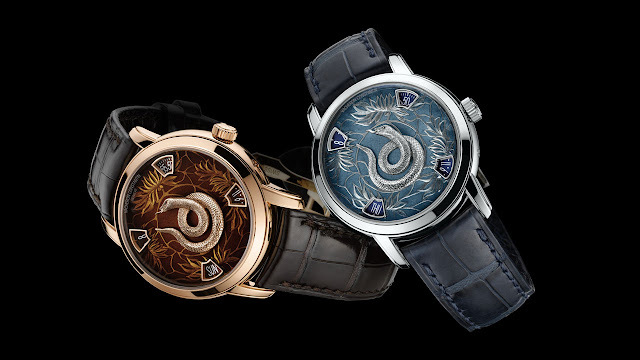 The Year of the Snake model, part of the Métiers d’Art The Legend of the Chinese Zodiac collection, is endowed with that unique touch of soul possessed by watches bearing the Hallmark of Geneva. With this exceptional collection, Vacheron Constantin intends to pursue its special ongoing dialogue with collectors and devotees of Fine Watchmaking.